The automation system PSS 4000 enables individual, high-performance and modular automation concepts. An innovation of release 16 in the engineering software PAS4000 now simplifies standardisation with modular machines much more. The automation system PSS 4000 is the answer to the flexible and modular production of tomorrow. 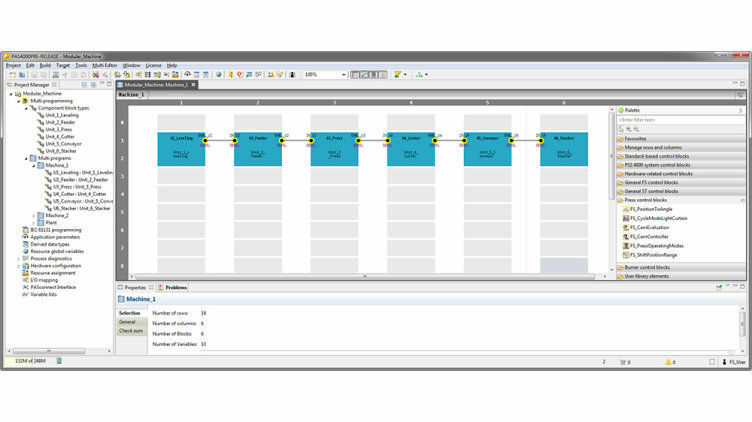 Thanks to this intelligent and simple Engineering software PAS4000, plant manufacturers can react quickly and flexibly to changing market conditions and necessary adaptations of module capacities. With the components tailored to your needs you can implement fast changes and flexible production procedures. The automation system makes plants highly available over the entire lifecycle and it supports Industrie 4.0 solutions. Want to manufacture in a customised and yet economical way as a plant manufacturer? Then you have to be able to efficiently manage several versions. This is the only way to enable high availability of your production lines. An innovation of Release 16 in the Engineering software PAS4000 of the automation system PSS 4000 makes it even easier to standardise modular machines. Configuration control via application parameters is now expanded by safety-related components. This way you can simply implement modular machine safety concepts with several versions or various function modules. The application parameters let the control system know during system start-up what hardware is present in the selected (machine) version and what program version is to be used. This way it is possible to create an individual PAS program with all possible versions and to select the relevant expansion version when commissioning. As a plant manufacturer you can improve production utilisation and optimise production processes. Changes to the plant can be made after project configuration, so that it is not necessary to adapt user programs. If a plant is to be made available in a different version, it is sufficient to change the application parameters. The project has to be created only once for all versions of the plant range. The big advantage: You can use a project that has been approved for several versions. The project check sum remains unchanged. All the application parameters that activate the individual functions of each version are included in an individual check sum. So it is apparent at a glance that only the values for the application parameters have been changed, and not the project itself.